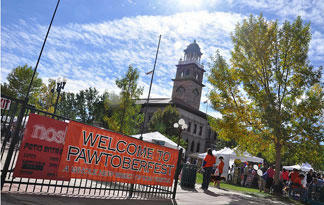 Taking a page from theOktoberfest, the Humane Society of the Pikes Peak Region puts its spin on the popular festival by sponsoring the annual PawtoberFest 5K (3.10 miles) every October. Held in Colorado Springs, runners and walkers alike bring their dogs and their passion for animals to support the work of the Humane Society. The event benefits the thousands of animals that the pet organization takes in every year. The festival begins with a 5K fun run and walk at America the Beautiful Park and ends at Alamo Square Park. Local businesses and vendor booths keep festival-goers busy and happy while food and beer samples from local breweries keep up the spirit of Oktoberfest. And since it's during the season of Halloween, this dog festival wouldn't be complete without a dog costume contest.